Growing up as a sickly child in Latrobe, Pennsylvania, Fred Rogers gained confidence from his grandfather's daily reminders of how special he was. It was his grandfather who inspired him later on to create Mister Rogers' Neighborhood, so he could remind children they are loved just the way they are. After graduating seminary, Mr. Rogers decided to take a risk and start working in television. He dedicated three decades of his life to creating the ideal community where differences are resolved, and everyone is valued. Successful and unprecedented as a children's television show, Mister Rogers' Neighborhood continues to stand out as a prime example of educational television. His show and outstanding personality have left a lifelong impact on countless fans. He will be forever remembered as an educator, pioneer, friend, and neighbor. Heroes should be dedicated, able to connect and reach out to others, and take risks. 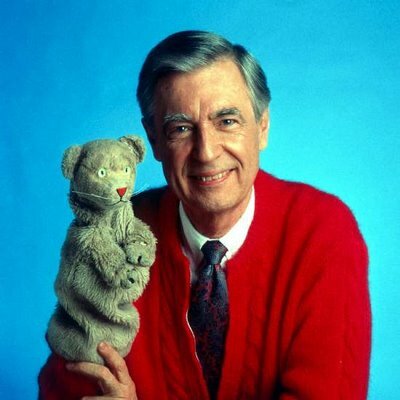 Fred McFeely Rogers, a TV pioneer and neighbor, made children feel appreciated and accepted through his dedication, connectedness, and risk-taking by creating the ideal community: Mr. Rogers' Neighborhood. Rogers with Daniel Striped Tiger. Mr. Rogers showed dedication in supporting families, especially the well-being of children, before, during, and after running the show, Mr. Rogers' Neighborhood. Mr. Rogers not only hosted the show, but he also "... [Did] all the puppets... [wrote] all the music...and [wrote] all the scripts" (Senate). Mr. Rogers had to get his message across in his own way because he cared deeply about his cause. He did more than what was required from him, not for personal gain, but because of the convictions his passion brought him. In addition to forming and hosting the show, Rogers was chairman of Family Communications, Inc. the nonprofit company that he formed in 1971 to produce Mister Rogers' Neighborhood and that has since diversified into non-broadcast materials that reflect the same philosophy and purpose: to encourage the healthy emotional growth of children and their families." (Fred). Not only did he utilize the show as means to communicate, Mr. Rogers used his company to distribute learning materials about common crises in children's lives. Extending his vision, Rogers worked above and beyond to help children in need, making pamphlets and educating parents about common crises in children's lives. Mr. Rogers worked for three decades on the world's longest running television show, as well as countless other projects to achieve his goals. Rogers with Big Bird from Sesame Street. To share his message, Mr. Rogers had to learn how to connect with every unique child, and his show helped him accomplish that. Rogers felt the need to connect with each individual on a personal level, saying, "I'm not that interested in 'mass' communications. I'm much more interested in what happens between this person and the one person watching. The space between the television set and that person who's watching is very holy ground." (The Company). Rogers knew children needed a sense of understanding, as well as friendship when building relationships. His community, the Land of Make Believe, was based on human connections, and how we all need acceptance, respect, and love. Furthermore, Mr. Rogers explained that, "We've got to have more of this neighborhood expression of care." (Senate). Through the ideal community, Mr. Rogers' Neighborhood Land of Make-Believe, Mr. Rogers utilized puppets and demonstrated how conflicts can be resolved, and fears can be faced. The Land of Make-Believe shows the "neighborhood expression of care" that Mr. Rogers mentions, because although there are conflicts throughout the show, they are resolved because the community cares deeply about each other. Mr. Rogers worked hard to create a relatable connection with children, the Land of Make Believe. The very beginning in Mister Rogers' Neighborhood. Mr. Rogers took risks throughout his career so he could share his vision. Right after completing seminary, Mr. Rogers consulted his family about working in television. They informed him that he didn't know anything about television, or even watch it, to which he replied, "I've seen enough that I think I'd like to try it and put my hand on it." (Remembering). Mr. Rogers took initiative instead of just hoping for change, and ended up fulfilling his dream. Instead of taking the expected route of becoming a minister, Mr. Rogers followed his ambitions and changed television forever. After working in television as a floor producer, Mr. Rogers had received an opportunity to create his own show, and "created (CBC), in Toronto, Ontario." Mr. Rogers chose to leave the profitable and relatively safe career path of being a floor producer, left the country, and created his own show without knowing what would happen next. He changed and modernized television to inspire, educate, and entertain people of all ages, all the creation of this show. Taking risks to achieve his goal in improving television proved worthwhile to Rogers. The early days of the show. 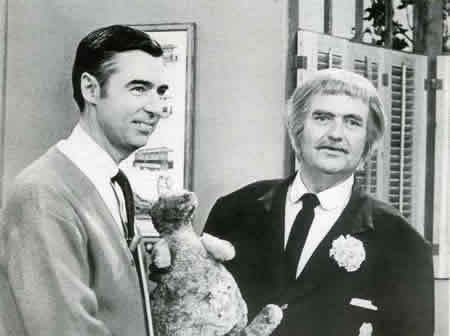 Rogers' dedication, ability to connect to others, and ambition shone through his work on Mr. Rogers' Neighborhood and the ideal community it represented. Mr. Rogers stayed true to his ethics in order to spread the love and kindness he had to offer. Rogers inspired many with his admirable traits. He made everyone feel worthy and loved, just as they are. Rogers' messages of acceptance and kindliness convinced others to become morally intact people. He has impacted others throughout their lives. Rogers' show taught children how to deal with their emotions in a healthy way. Rogers is an exemplary role model, a direct contrast to the violent and vengeful things we see other television shows. Although people view heroes as physically strong, Rogers was a hero by using his commendable worth ethic, his friendly personality, and the amazing way he connected with others. He charmed his viewers with the goodness of his heart, without avarice or an agenda. The shy, piano-playing boy from a small Pennsylvanian town grew up to become one of television's most powerful and celebrated icons. Fans of all ages looked up to Rogers as a role model, leader, and friend. We should all strive to be like Mr. Rogers, and accept everyone as a neighbor. "The Company Fred Rogers Began." The Fred Rogers Company. The Fred Rogers Company, 2011. Web. Dec. 2011. <http://www.fredrogers.org/new-site/about-us.html>. "Everything I Ever Needed to Know, I Learned from Mr. Rogers." PBS KIDS: Educational Games, Videos and Activities For Kids! 2009. Web. Dec. 2011. <http://pbskids.org/rogers/iLearnedFromMrRogers.html>. "Fred Rogers' Biography." The Fred Rogers Company. The Fred Rogers Company, 2011. Web. Dec. 2011. <http://www.fredrogers.org/fred-rogers-bio.html>. "Fred Rogers Company." The Fred Rogers Company. The Fred Rogers Company, 2011. Web. Dec. 2011. 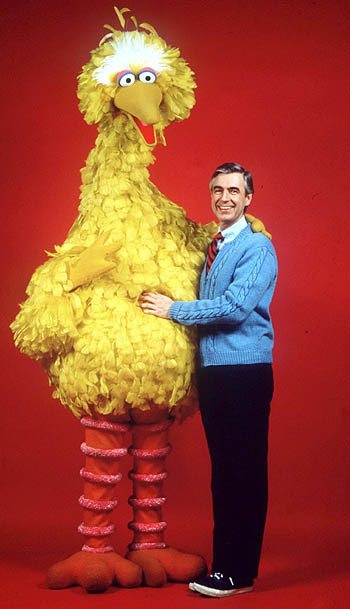 <http://www.fredrogers.org/new-site/about-us.html>. Remembering Fred Rogers. 2011. Web. Dec. 2011. <http://pbskids.org/rogers/neighborsOfAllAges.html>. Senate Hearings 1969. 2009. Web. Dec. 2011. <http://pbskids.org/rogers/neighborsOfAllAges.html>.